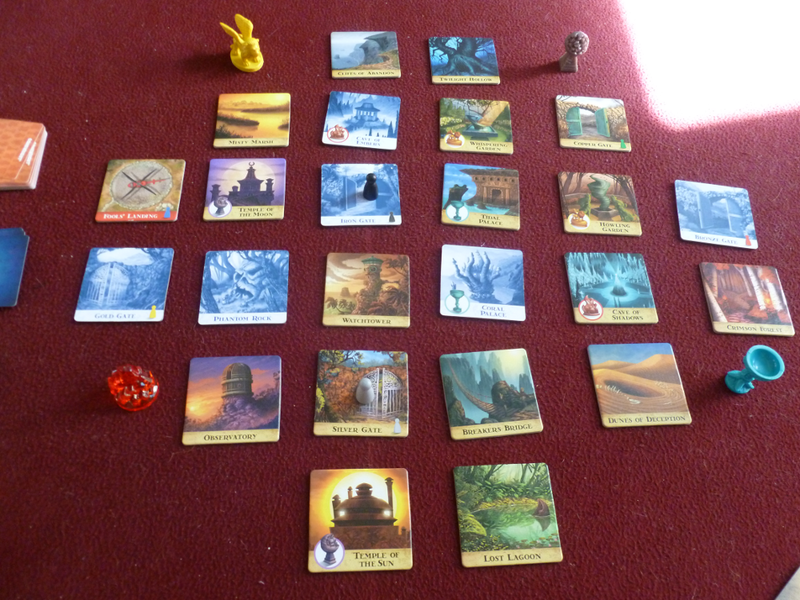 Forbidden Island is a light co-op game which places you and your adventure-seeking friends on an ever sinking island. In your astute wisdom, you all decide that it truly is all about the Benjamins and that you should grab all the treasure off this crumbing island. But don’t worry, not only do you have multiple helicopters lying around, but you can also somehow restore any part of the island that’s flooded to its gloriously dry state. A little far-fetched, maybe, but definitely a fun little filer and a great stepping stone game for learning mechanics common in much more complicated games. If you’re thinking about Pandemic or even Defenders of the Realm and haven’t played many other games yet, you might want to try Forbidden Island first to see if you like the style. 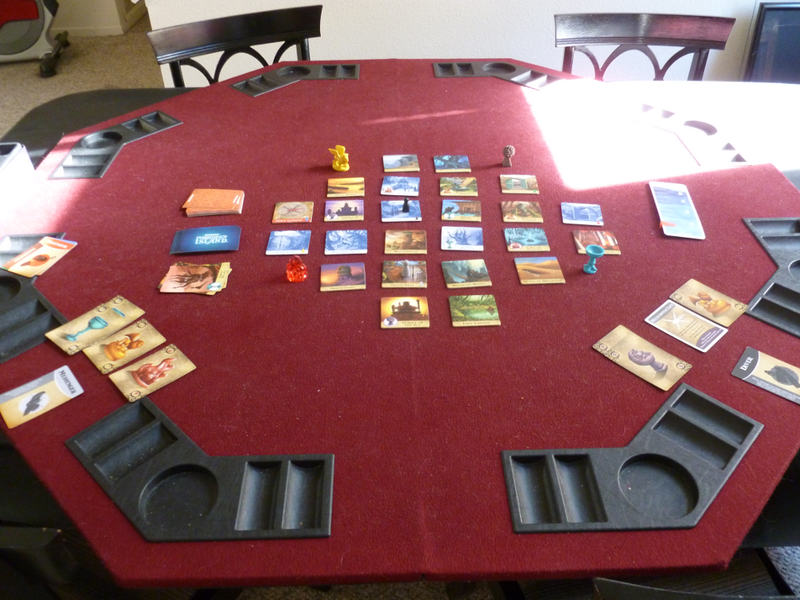 Forbidden Island, like any respectable filler, is simple to set up. Shuffle the location tiles and place them face up to make your island. The original game only gives one setup for the island, a cross shape, but you can go online and look up other formations or make up your own to mix things up a little. 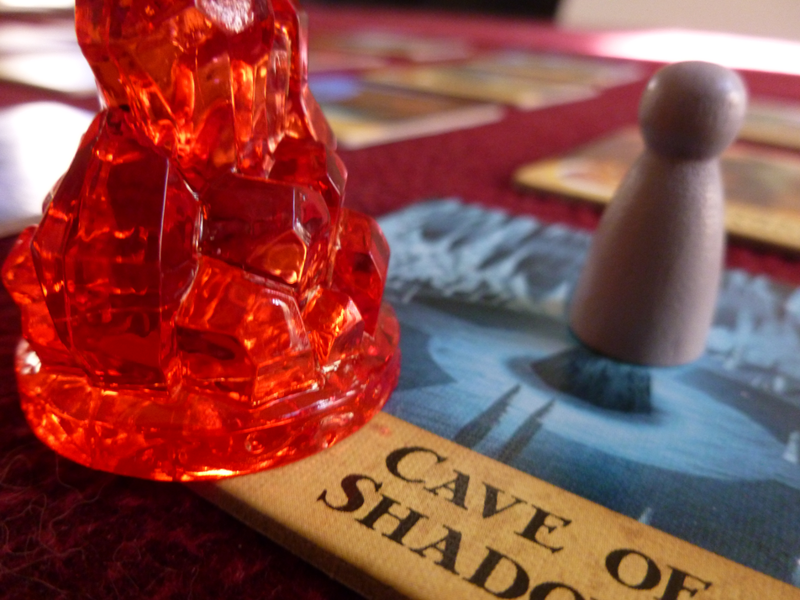 For your first game, you should probably stick with the base shape, as other ones can be a tad trickier. Assign (randomly or otherwise) the role cards to each player. Be sure to make note of your special ability. Grab your color-coded pawn and place it on your unique starting tile. Start tiles are easy to tell apart because they have little pictures on them that match the color of your pawn. 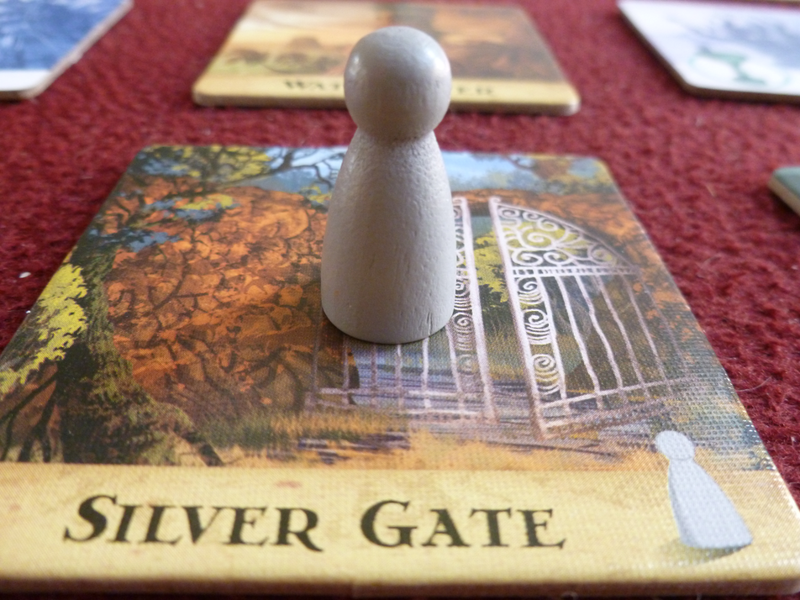 here the messenger is chilling out at the Silver Gate before he makes some gold (selling of the treasures not portrayed in this game. Also not portrayed: the rockin’ house party he holds the following weekend). Shuffle the Waters Rise cards into the orange-backed treasure deck. Deal everyone out two treasure cards. If you pull a Waters Rise card at this point, simply ignore it and shuffle it back in. Now prepare your initial island. Draw the top six cards from the blue backed deck of flood cards. For each location you pull, turn its matching tile over to its blue and white flooded side. Place cards you pulled to the side of the deck, face up. Place the flood card indicator to the side of the setup. This tells you how many flood cards you need to draw at the end of each player’s turn. For beginners, start on one of the number 2 values, so that you only need to draw two cards to begin with. Each time you draw one of the Waters Rise cards, you need to push this indicator up one value. You can put the treasure figures anywhere. We usually put them in the crooks of the island’s cross, but you can place them anywhere off the board. Next we’ll go over how to get these babies for yourself. You can place the treasures anywhere. We place them in the crooks so no one will steal them. The object of the game is to grab all four treasures amongst all the players and successfully escape the island via helicopter. Helicopter card, that is; there’s a role called the Pilot that can ferry himself around the island, but he’s kind of a jerk and won’t let anyone else taint his air Ferrari. Or maybe it’s a SmartPlane and can’t fit more than one person in it. The world may never know. At any rate, the only way to claim one of the treasures is to have four of your hand’s five card limit devoted to cards bearing your treasure’s likeness. Once you have four, you can go to one of two turn in locations that also share the treasure’s iconography (what a courteous island). Turning in four matching treasure cards at one of the two locations (Temple of the Sun here) lets you claim the ancient broken globe…thingy. It kind of got the short end of the stick, considering all the other treasures are in immaculate condition. Move yourself to a different location. This is limited to one tile per move usually. Give a treasure card to a fellow player. Claim a treasure (if you have all four of its cards and are at the right location). “Shore up.” This consists of turning a blue flooded tile over to its colorful non-flooded side. And no, I don’t how this is actually physically possible. Mayhaps the magic of friendship. It is a co-op, after all! Cave of Embers, Iron Gate, Bronze Gate, Gold Gate, Phantom Rock, and Coral Palace are all flooded since their tiles are flipped over. You can also play any special cards you may have. These don’t count as actions and can be played at any time, even on another player’s turn. There are only two special cards in Forbidden Island, the Helicopter Lift, which can transport all occupants of a single location to any other location, and the Sandbag, which can instantly shore up any location on the island, regardless of your current location (you obviously have monstrous upper body strength – you carry around all those helicopters, too, you know). At the end of each of your turns, you draw two treasure cards. If you pull a Waters Rise card, reshuffle the discard pile and put it on top of the flood deck. In either case, draw as many flood cards as the indicator tells you (between 2-5). If any cards you pulled are currently flooded locations, remove both the location’s tile and its flood card from the game. The island has begun to sink! The waters Rise cards explain exactly what to do on them, which helps when you’re learning the game and aren’t familiar with the process yet. You will learn to dread the flash of white and blue as you flip the card over! Fool’s Landing sinks (it can still be flooded, but can’t sink completely). You can’t collect one or more of the treasures. This happens if both of the turn in locations for a treasure have sunk before someone claims the treasure within. Anyone in your party dies. You can swim to an adjacent tile if the one you’re standing on sinks, but if you’re out in the boonies and this happens, you’re all out of luck. A successful game! 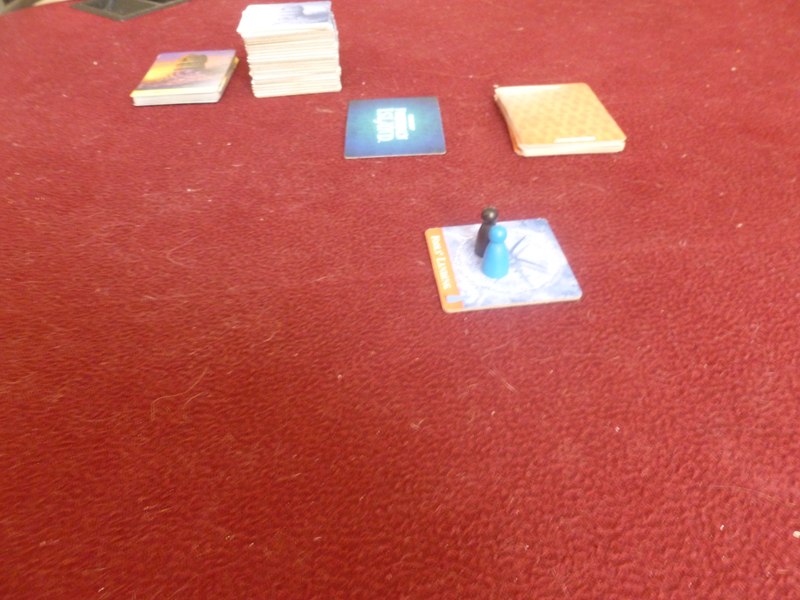 The flood level only got up to four (so four location cards pulled at the end of each player’s turn), partially because we were scaredy cats and only started at the Novice (lowest) level. I mean- we definitely started at the highest level. Yeah. Don’t forget to make use of your role’s special ability. I find that all of the roles’ special abilities come in handy at least once per game, even if you don’t see yourself using your ability at the start. Be creative! Sometimes your ability can make things much easier or efficient for everyone. 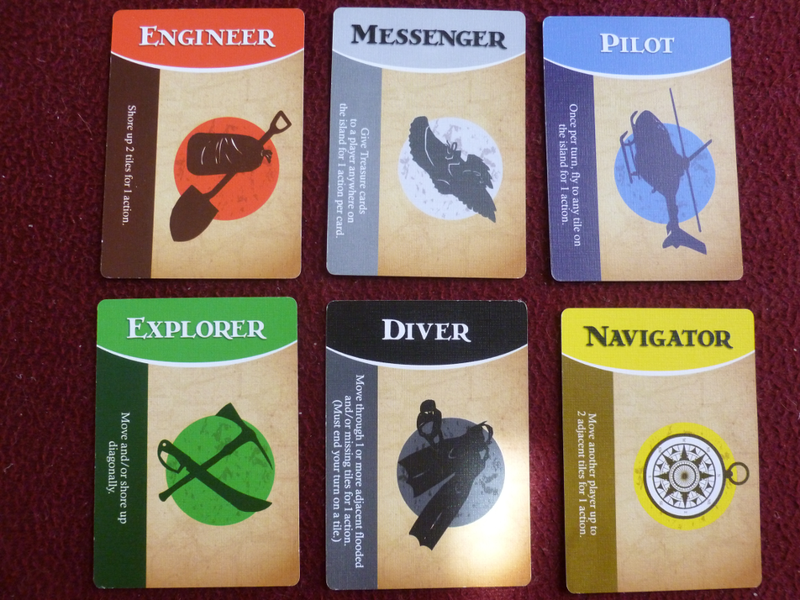 The six role cards – Explorer (shore up two cards for one action), Messenger (give someone a treasure card no matter their location), Pilot (move to any location once per turn for an action), Explorer (move diagonally), Diver (move through any number of flooded/sunken tiles for one action), and Navigator (move other players’ pawns like your own). Always shore up important locations like Fool’s Landing, whether through an action or a sandbag – unless you like watching victory float down into the murky depths. Remember that you only need one of the treasure turn in locations up to turn it in. If you need to, you can always sacrifice one if it looks like you can’t get to it before you pull more flood cards. Just be sure to protect the other one until you get that treasure in your hands. In a similar vein, once you’ve claimed a particular treasure, its turn in location isn’t as important anymore. You can sacrifice it easily at this point. Just remember to always plan a path back to Fool’s Landing unless you have an extra Helicopter Lift lying around – if you can’t get back, you can’t escape! Keeping track of how many Waters Rise cards you pull can help you be a little more daring – or more careful. If you’ve pulled all three, you know that none of your flooded locations are in danger until the deck gets shuffled again. So if your actions would be better used for moving, trading, and turning in, you can afford to do that instead of shoring up until the deck turns. A bad pull from the flood deck can leave you stranded if you didn’t keep an escape route open. I hope you have some Helicopter Lifts handy! You can play your special cards before you discard them. Take a moment to see how you could play a sandbag or Helicopter Lift best before you discard it if you’re forced to. Even if you can’t do much to help yourself, you might be able to set up something good for the players that come after you by opening up some actions that they might have had to spend shoring up or moving. 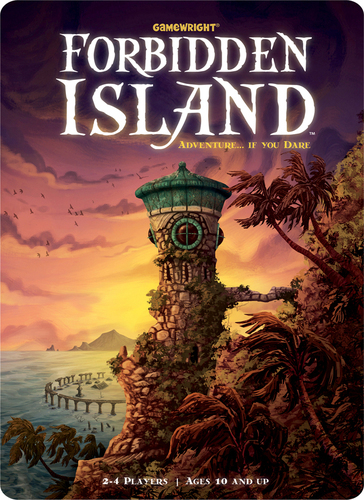 As our very first hobby board game, Forbidden Island will always have a special place in our hearts, even if we’ve moved on to other games for the most part. It’s a simple, attractive, and quick game, making it great for filling spaces between heavier games or as a gateway game to introduce new gamers to cooperative mechanics and hobby board gaming in general. Since it’s a co-op, there are no antagonistic confrontations, and working together to figure out the best path to get the treasures and get out makes it a very satisfying couple’s game that will have you communicating for the better. 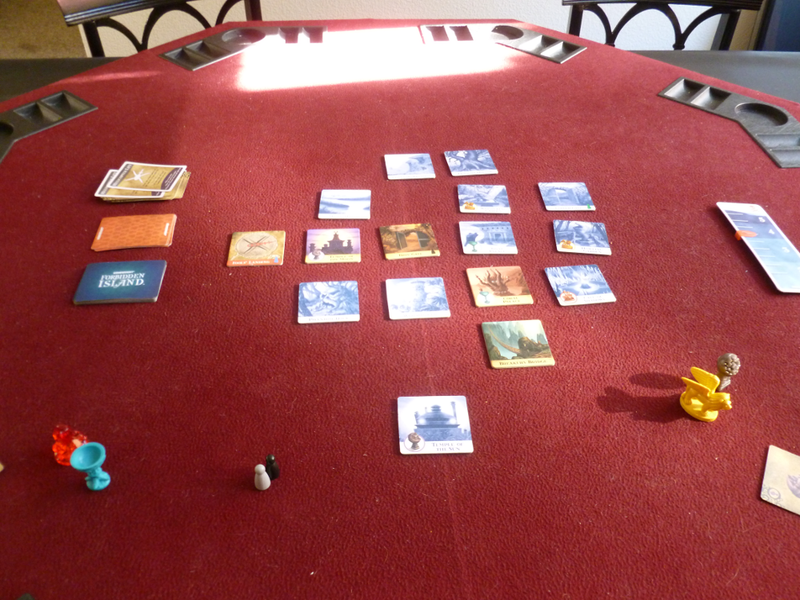 There are a few random elements in Forbidden Island: the placement of the island’s tiles in the beginning, the treasure deck’s order (including when the Waters Rise cards are pulled), and the flood deck order. I feel these are all necessary, as they keep the game from being the same, and thus solvable. None of the elements are irritating, and pulling Waters Rise cards (and anticipating pulling them) serves to build up tension and keep the game exciting. 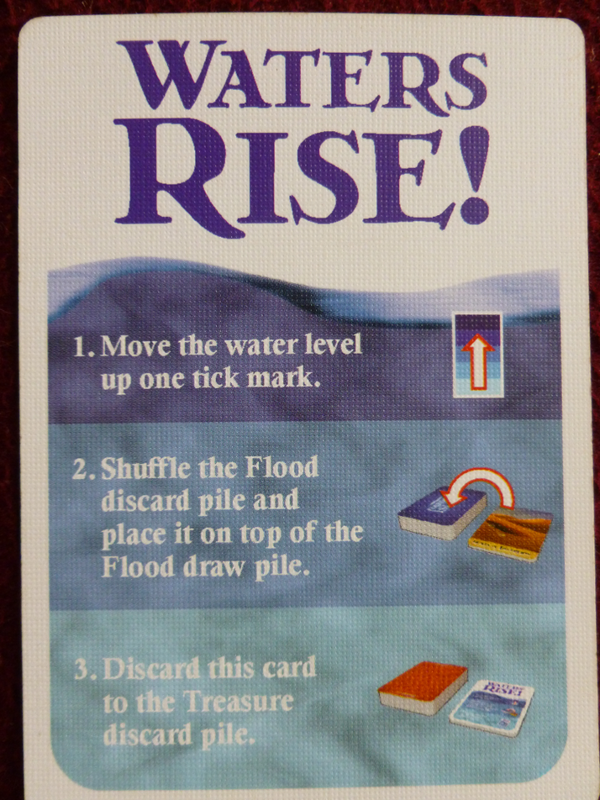 Since the flood level rises with each Waters Rise cards (similar to a mechanic in Pandemic), the amount of flood cards that must be pulled can thus increase very rapidly or very slowly, making the game tense or leisurely. However, since the game is simple and plays very quickly, I don’t dislike this mechanic. I feel without this and the other random elements, Forbidden Island would probably be beatable on every try, thus relegating it to a game to placate upset children. When you do lose (which isn’t that often when starting at low flood levels), the loss usually comes quick enough that you can play another game or two to make up for it. 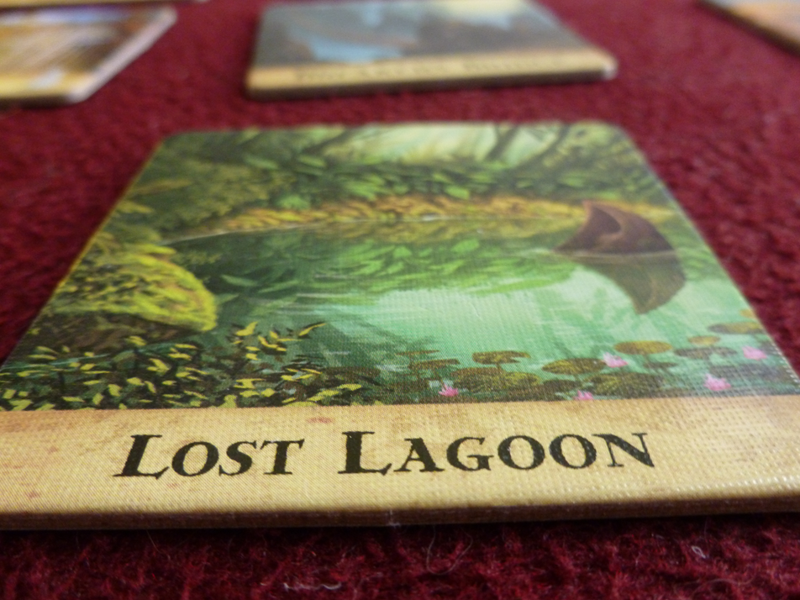 For me, personally, I feel like Forbidden Island is the perfect length for the amount of luck it has – longer games like Pandemic and Defenders give me kind of a sour taste in my mouth if we lose due to bad luck, but Forbidden Island is short and simple enough that it really doesn’t bother me if it happens. It’s usually just funny more than anything – for example, it’s possible to lose in the first round, which happened to us – the setup had us flood Fool’s Landing, which Erik couldn’t shore up, and then at the end of his turn he pulled a Waters Rise and had to sink Fool’s Landing, ending the game before I’d even had a turn! This was actually a winning game for us, using a Helicopter Lift before we had to inevitably pull the Fool’s Landing card again. Extra table space left in to show the vastness of the ocean surrounding the poor little watery Fool’s Landing after all its friends had abandoned it. With three actions per turn and smart use of roles, most problems caused by bad luck can also be mitigated through efficient play. Often there’s a “best” move, though finding it isn’t very difficult. Generally there isn’t any long-term strategy past “get the treasures in the easiest order and then escape with a Helicopter Lift you’ve been holding onto,” so it comes down to what you employ turn by turn to get the treasures and not lose your island. So, while there is strategy involved, it isn’t very deep and tends to be the same for each game, so you end up relying more on changing up your tactics to make the most efficient plays. Theme isn’t exceptionally strong, but good art does make up for a lot. The pieces are only pawns and are identical except in color, so the only thing differentiating you from the other players is your role card and your start place. The roles make sense for their character title with little imagination or stretch required. There is no special thematic rule for getting the treasure except that you must be in the turn in spot, but that would probably add unnecessary complexity to a simple game. It is a little thematically fishy how you can get the treasure at either turn in location though – how exactly can it be in two places at once? Underground tunnels connecting them? Magical teleportation? Regardless, for such a light game, the theme isn’t really an issue, and good aesthetics and sensible special actions for the roles keep you immersed. You can always place the treasure on the right tile and get really close to view things from a pawn’s eye view for instant immersion. Just imagine you’re actually a white pawn out to collect a humongous translucent fire and you’re set! You will probably be talking a lot with your fellow adventurers – if you’re not, you’ve either played this game too much with the same person and you both know all the optimal moves, or someone is taking too strong of a leadership role (a.k.a. Bossy McBosspants, if you read our tl;dr). So depending on your group, it can be very fun discussing tactics and what everyone could do on their turn to help the most. If someone in your group or your S.O. has a hard time not ordering people around, you might have to give them a time out from talking or start a rule where advice can only be given if asked for. I would definitely recommend not overdosing on this game with your S.O. or same friends too much. Since it is a fairly simple game, you’ll find yourself picking up on the best moves pretty fast, which, as I mentioned in the above section, can lead to a very quiet game, since no discussion is necessary to figure things out. Though Erik and I have reached this point, we still keep it around for our friends and as a very good introductory game for new players or if it’s been a long day at work and we want something simple and quiet, of course! 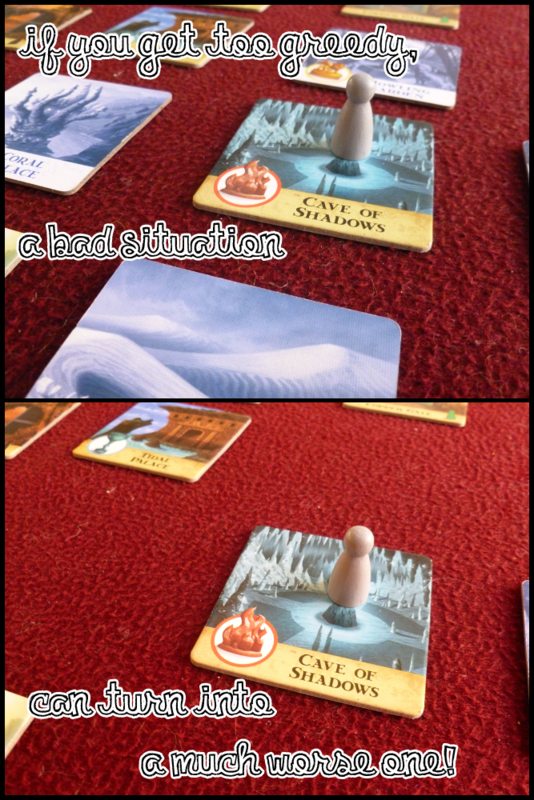 Forbidden Island is a light game. It’s quick and not too mentally taxing, especially once you’ve got the game mechanics down. It plays well with all ages and types of players (children, grandparents, and parents all have a good shot of liking it) though more seasoned board gamers will probably only use it as a filler every now and then. I feel like the game is pretty gorgeous. The main focus of the game, the location tiles, are all colorful and vivid and very nice to look at. It would be nice if there had been some more visually interesting way to denote a flooded tile other than turning its picture blue and white only, but the method does its job and it’s easy to distinguish which tiles are flooded quickly. The pawns also would have been cooler if they had been meeples or figures, and the role tiles are only symbols, but these serve their function well enough and do add to the aesthetics, albeit in a minimalistic way. The treasure cards are simple and clean, and the treasures themselves are really cool; though they’re only one color, it doesn’t bother me too much because the sculpts are good and it keeps them visually distinctive. Plus you can always paint on details if you really want that extra depth. The art is high quality and makes the game colorful and pleasant to look at. The quality of the components is high. The cards are just that – basic cards – but the tiles are made of sturdy, thick cardboard, the pawns are wood, the flood indicator is sturdy and the slider stays on, and the treasures themselves are chunky, durable plastic with a good amount of detail on them. The game itself also comes in a tin instead of a cardboard box, which kind of sets it apart from most current games. 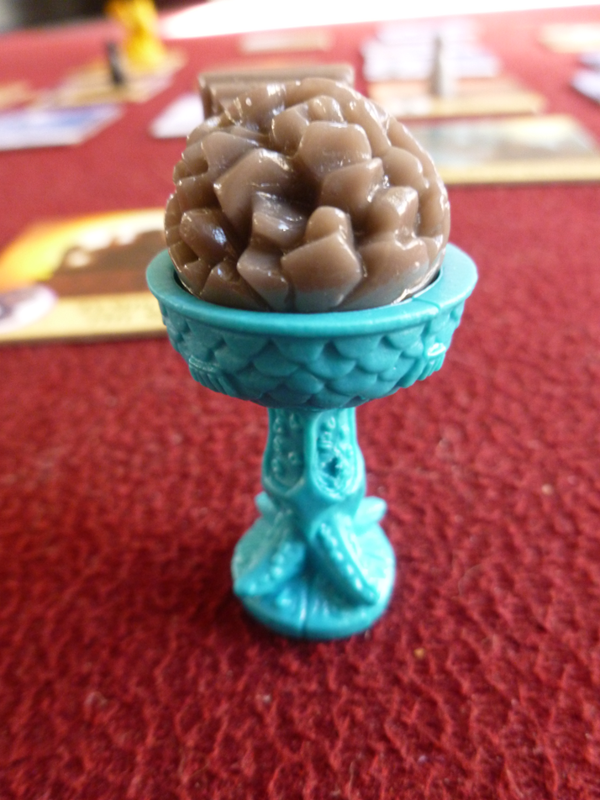 Plus, the broken globe thing fits into the nautical-themed chalice! It’s like they were made for each other. With good components, pretty art, solid gameplay, and a wide audience, I think Forbidden Island is definitely a good game to add to your collection. Especially if you’re just looking into board games beyond the mainstream fare, for about $20, Forbidden Island is a great investment. 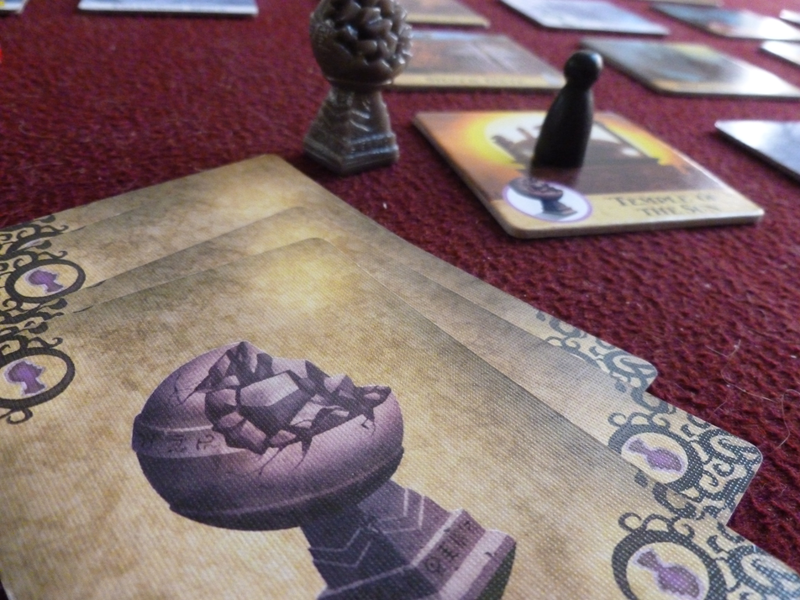 Erik and I played Forbidden Island before breaking into deeper board games, and though it suffers a bit on replayability, we’ll definitely keep it around to introduce to other new players or mixed groups. Though I doubt you and your S.O. will be playing it every night, Forbidden Island is a good game for couples when they want to wind down or want a quick cooperative game. You’ll probably find yourself spacing out your games so it doesn’t get old, but when you do bring it out, you’ll be sure to have an enjoyable time. The navigator’s role confuses us… when he is able to move other people? Is it during the navigator’s turn or the other players’ turns? I know he can move each person 2 spaces instead of the 1 space per action, but it doesn’t specify during whose turn. For example, The explorer needs to move 2 spaces, I am the navigator. Do I move him during one of my actions or during one of his actions? You can only use the Navigator’s role during his or her turn, I believe. It is something the Navigator can do instead of a different action. So, he could move twice (2 actions) and for his third action, decide to move the Explorer 2 spaces. However, I don’t think you can combine roles, so for example I don’t think you can move the Explorer diagonally on the Navigator’s turn. Hope that helps! The navigator can move the Explorer diagonally. He can also move the diver across water, as well as up to two spaces as long as the 2nd space is land. The navigator can move the pilot up to 2 spaces but doesn’t get to use the pilot ability of picking any tile.